Created, designed, and built by Nikolai Zykov in 1992. Height: 100 cm / 39 in. Materials: papier-mache, foam plastic, foam rubber, wood, metal wire, fabric, glass furniture. First presentation - December 16, 1992, Residence of Military Attaché of France in Moscow. 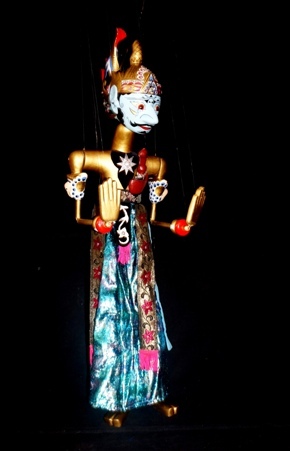 The puppet is made in conformity with traditional Indonesian puppet art, and shows the Hero of Indonesian fairy-tales with his flying magic dagger. See PHOTO ALBUM of INDONESIAN PRINCE.